A few weekends ago we took a trip to Bessho Onsen, a little town near Nagano, in a pretty little snowy valley. It's the last stop on the local train and has several ryokans and shrines. 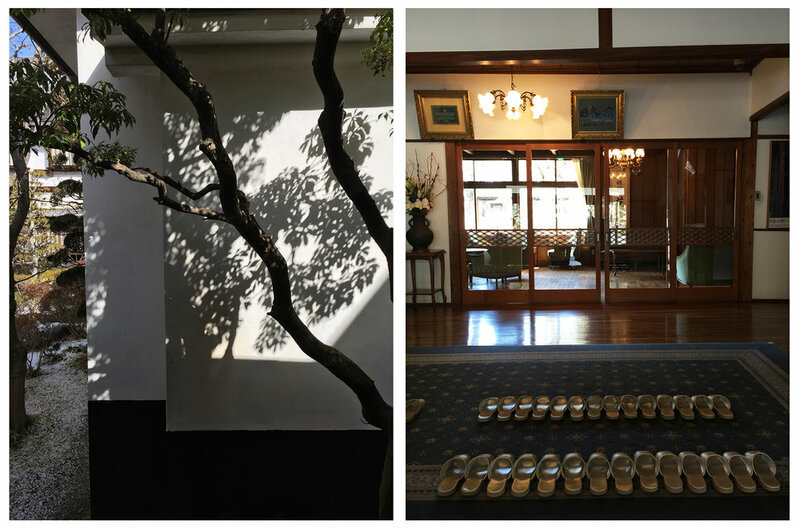 We stayed in a magnificent place called Ryokan Hanaya Nagano. 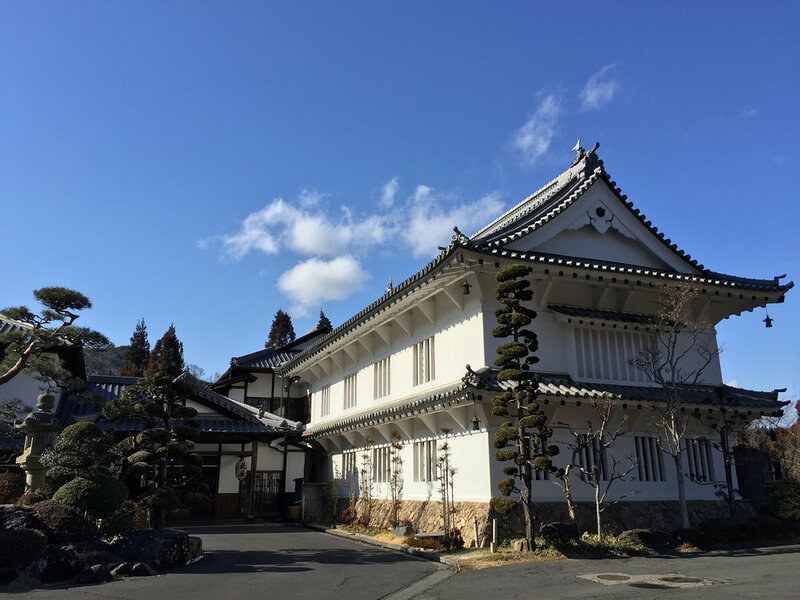 It used to be a Samurai residence, and has been a ryokan Since the Meiji era. 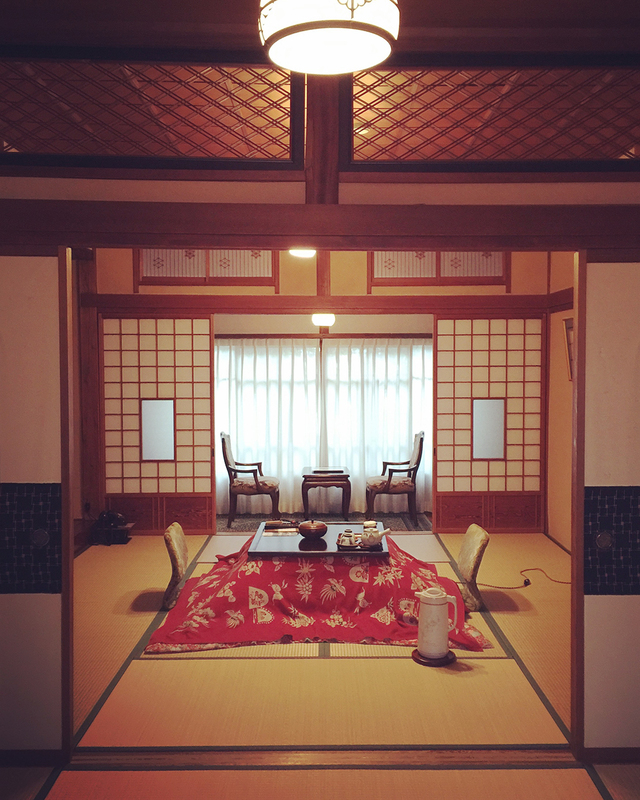 Our room was sublime and we spent most of our time there tucked up cosily in the kotatsu! 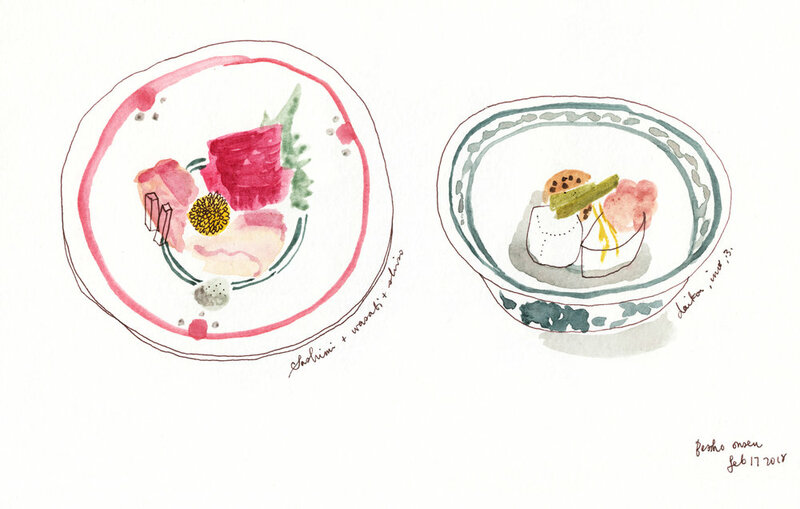 I loved the rotemburo, the baths and the dining rooms and drew some of the beautiful dishes we were served. 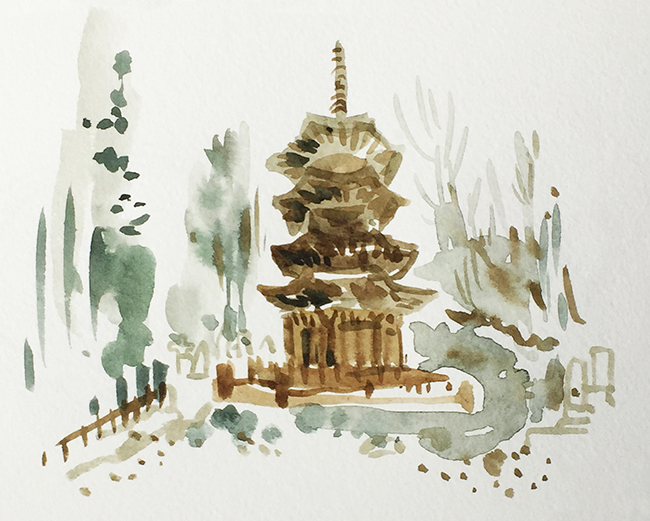 We walked around the town in the freezing but beautiful sunny weather and admired Anrakuji where the wooden octagonal pagoda is a national treasure of Japan. It is the coldest winter in Tokyo so far in the Heisei period (the last 29 years) and last week it snowed; suddenly and violently and beautifully. I walked outside in the early evening to take a look... and found a little local shrine, glowing in the snowfall. So magical, just for a night. As usual, I like to make my birthday last longer than a day, so I had three! On my actual birthday I went out for dinner to the Cliff House in San Francisco, and enjoyed a relaxed dinner with sunset views over the Pacific. I was given a little cooking course as a gift, and spent the next morning with chef Jean Yves in his kitchen learning how to make pate a choux and eclairs. So delicieux! Then my birthday picnic in the park. I love spending time with friends, eating sandwiches and cake, in the sunshine on a lovely day... Summer birthdays are the best! This weekend I did a little sightseeing around where I'm staying, in Kawaguchiko, Japan. There are a series of caves you can visit at the foot of Mt Fuji, formed from lava from the last eruption. The Narusawa Ice Cave is one of them, and is a National Monument. And also a little bit scary to get through due to the extremely low ceilings. The entrance is fascinating, as you go down under the floor of the forest, and suddenly it's literally ice cold, like you've walked into a fridge. The haze you can see in the photo is the air condensating between hot + humid and freezing! A walk in the sea of trees, along lava strewn paths, was also truly beautiful: it had my favourite combo of moss and ferns. I visited a site called Saiko Iyashi no sato NENBA, a recreation of a thatched village that was destroyed by a typhoon in the 60s. Each lovely building had examples of local crafts. And of course, a visit to the opposite side of Lake Kawaguchiko, to get a magnificent view of the sacred mountain, looking just like a Hokusai print. I've just arrived in HK and am loving being back in the warm weather. I spent a day wandering in Causeway Bay and Wanchai, soaking in all the sights and sounds, especially in the wonderfully noisy markets... Here's how it looked on the day! I've just got home from my trip to HK, and looking through all the wonderful things I did while I was there. It's especially great thinking about the monoprint workshop I did with the illustration students at the Hong Kong Design Institute. It was truly wonderful to see them making a mess and getting really into it. I think they were all happy with the work they produced. Here are a few pieces of the students' work that I thought worked especially well... I also gave a presentation about my work and being an illustrator. I may have scared them, but hope I put resolve into the ones who are serious! I'm in Hong Kong at the moment, working on all sorts of projects, and loving being back after far too long. I had breakfast at the retro Hoi On Cafe with a friend and did a quick sketch.. I adored the glossy red booths! I visited my favourite sort of hardware store... ...and wandered the evening streets, admiring the old and fast disappearing Hong Kong.